Calgary-based US Oil Sands (USO) officially entered into receivership this week, allowing its creditors to liquidate its assets. 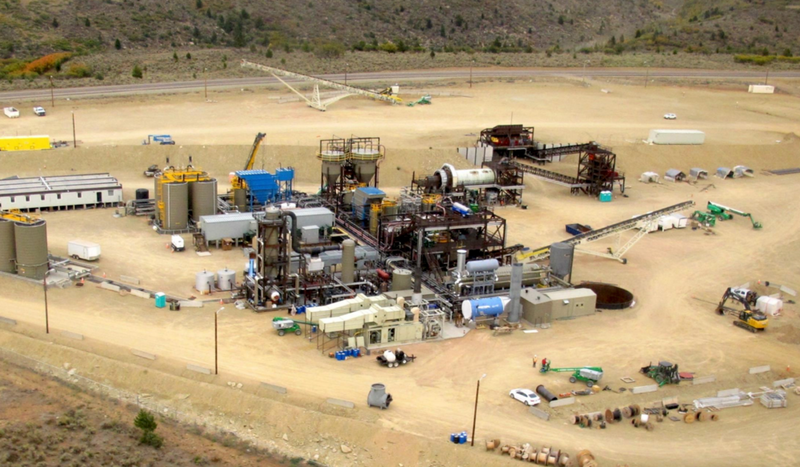 The company's crown jewel is its PR Spring Project, a 2,000 bbl/day commercial demo plant located in Utah's Uinta Basin. USO says plant cost as much as US$62.5 million to build. Unlike oil sands deposits in the Athabasca region, bitumen contained within Utah's oil sands do not easily separate from the sand using just hot water. The company uses a proprietary citrus-based bio-solvent to extract the bitumen, eliminating the need for large volumes of water or tailings ponds. Much like conventional water-based mining operations, the mined oil sands is first "de-lumped" in a crusher then mixed with hot water and solvent within a horizontal rotary drum. The slurry is then gravity-separated, allowing the coarser solids to settle and be removed. The bitumen/solvent/water mixture is then further cleaned in a bulk separator, followed by a decanter and disc stack centrifuges, removing all solids and water. The solvent contained in the solids-free diluted bitumen is flashed-off and returned to the front end of the process. USO had hoped to deploy the technology in the Athabasca basin, promising a much cheaper extraction process with far less water requirements and lower GHG emissions. The company had almost completed construction of PR Spring in 2016 when it ran out of working capital and was forced to halt construction. Construction was restarted after the company issued $13 million in new shares, then stopped again when it ran out of funds for a second time. In January 2017, USO then secured another US$7.5 million loan from its largest shareholder, Luxembourg-based ACMO. The loan carried a hefty 15% interest rate, repayable after one year but extendable for another year if the demo plant could average 1,500 bbl/day for 30 consecutive days at an operating cost below US$45 per barrel. USO also agreed to grant ACMO 24 million share warrants, which were eventually cancelled, rendering the company's stock worthless. Commissioning resumed in early 2017 but the facility suffered a mechanical failure of its decanting centrifuge during a test-run with solids. Another US$2.5 million in working capital was then made available to USO, provided the plant could produce 500 bbl/day for five consecutive days. In the summer of 2017, the company warned it had "significant doubts" that it could continue to operate, but said it intended to work towards optimizing the facility until first oil was achieved. In September 2017, USO went into receivership, leaving the company and its assets to be taken over by ACMO. USO was pulled into bankruptcy proceedings last November and a full liquidation of its assets, including intellectual property, is now in progress. According to the company's liquidator, the plant is "complete and ready for start-up," now requiring about $2 million for "minor modification of equipment and vendor support" before operations can resume. If first oil is eventually be achieved, PR Spring would be the first commercial oil sands mining facility to employ a solvent extraction process.